Activities highlighted in RED will be located at the Tiny Firehouse Stage. Activities highlighted in ORANGE will be located at the Outdoor Music Stage. Activities highlighted in BLUE will be located at the Tiny Traveling Theatre. Activities highlighted in PINK will be located at the Indoor Stage. Activities highlighted in GREEN will be located at the Nawaka Victorian Tiny House Stage. Activities highlighted in PURPLE will be located at the United Tiny House Rental’s Gypsy Wagon Outdoor Kitchen. 9:00AM-12:00PM: FREE Student Entrance for Public, Private and Homeschool Students (Grades K-12). This is for pre-registered schools and students ONLY, and is NOT open to the general public. Teachers can register their students HERE. 8:00PM: Gates Close at 8:00PM and re-opens Sunday morning at 9:00AM. 10:00AM: Tiny Traveling Theatre – Opening Comments and Announcement. 6:00PM: Gates Close at 6:00PM and re-opens Sunday morning at 9:00AM. 10:00AM: Tiny Traveling Theatre – Opening Comments and Announcements. 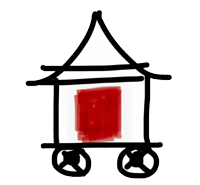 5:00PM: Tiny Traveling Theatre – Tiny House Awards Presentations, Prize Give-Aways, and Closing Statements. 6:00PM: Gates Close at 6:00PM. THANK YOU EVERYONE FOR COMING OUT… WE’LL SEE YOU ALL AGAIN NEXT YEAR (2019) FOR THE 4th ANNUAL FLORIDA TINY HOUSE MUSIC FESTIVAL, NOVEMBER 22-24, 2019! Children’s activities, food concession sales, and all the tiny homes will be available throughout the day.